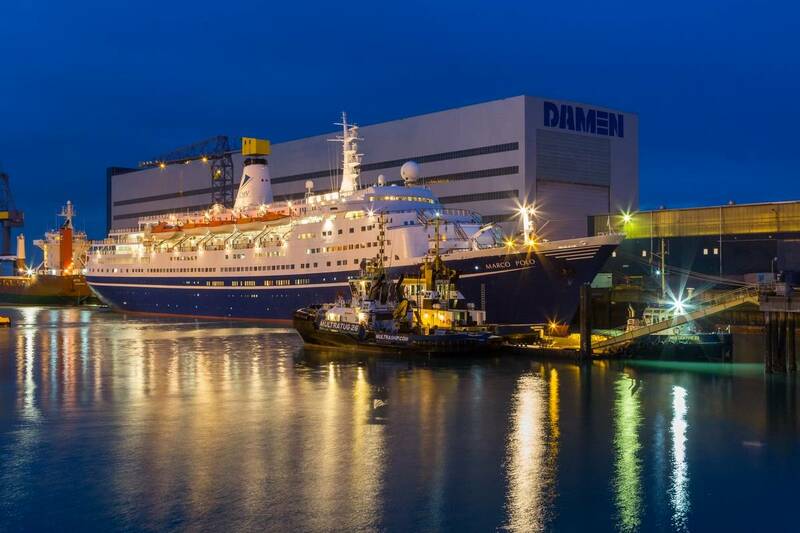 Damen Shiprepair Vlissingen (DSV), part of Damen Shiprepair & Conversion (DSC), has said farewell to Marco Polo, the 800 passenger cruise ship owned by Global Maritime and operated by Cruise & Maritime Voyages. An elegant vessel whose design harks back to an earlier era, the Marco Polo had a full schedule of works during her time at DSV. These included an exterior repainting, interior repairs and maintenance to bring her back up to her usual high standards. Other actions included work on the propellers and propeller shafts, reconditioning the bearings on the main engines and servicing the air-conditioning units and gensets. The life-rafts and other safety equipment were also removed and serviced, the cranes and winches overhauled and various minor steel works performed. Marco Polo arrived at Damen Shiprepair Vlissingen on November 3 and departed on December 14. 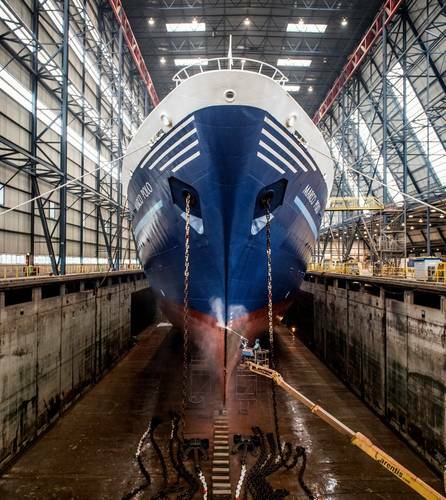 As well as the works on the Marco Polo and Astor, recent projects by DSC include repair and maintenance contracts on the 3,220 passenger MSC Magnifica and the 720 passenger Saga Sapphire, both undertaken at Damen Shiprepair Rotterdam. In the summer the 1,250 passenger Magellan also completed a five-week scheduled maintenance stopover at Damen Shiprepair Amsterdam while the 4,100 passenger Norwegian Epic departed Damen Shiprepair Brest on the October 17 following a three week scheduled refit and maintenance program.